This is one of the series of Raku Ware Pottery now available on this site (mostly now sold but others will follow shortly). Each piece has been handcrafted in Yorkshire, England. This Japanese method of creating beautiful decorative vases is becoming increasingly popular in the UK and our selection, albeit currently quite small, is likely to increase. Apart from the intrinsic style and effect, each piece will be unlike the next one because of the method of creating this effect. Therefore, forget limited editions, these are genuine one-offs, especially suitable for display purposes. A point to consider is that this type of firing results in the article being slightly porous and, although the Japanese have long used such pieces in their tea-making culture, over a period of time, any liquids will eventually seep away. 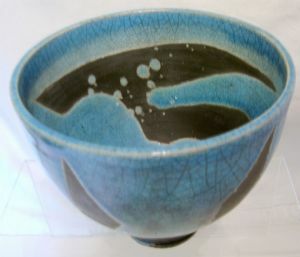 Each pot is individually created but is brand new and just as it was when it left the kiln. This one measures 5 inches (12.5 cms) tall and has a top diameter of 5.25 (13.5 cms).